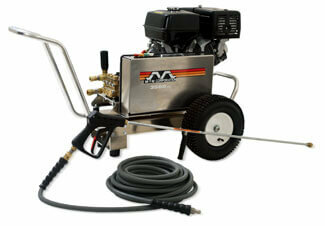 Mi-T-M has been manufacturing top-quality pressure washers for 35 years. Their brand is built to industrial standards but they have gone one step farther. Mi-T-M pressure washers having gasoline engines are certified by ETL. This certification is the legal equivalent of UL-1776 Standards. Electric units have CSA certification. Pressure washers bearing these trademarks have been rigorously tested by independent review. Testing under these guidelines ensure safety and assurance. Commitment to excellence from quality control to customer care make Mi-T-M a great partner with Ultimate Washer. The CBA series is lightweight but designed to run all day long. Belt Drive models give extended pump life. Unit is mounted on an aluminum frame. Seven year warranty on AR pump is best in the industry.